Hey! Green tea, grape seed and mooore! Proancynol 2000 contains some of the most powerful, natural antioxidants ever discovered. A unique blend of green tea, grape seed extract, alpha-lipoic acid, and other powerful antioxidants, helps fight free radicals and maintain a healthy immune system. 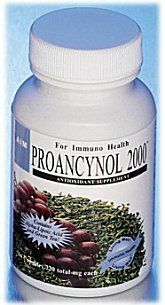 AIM Proancynol 2000 combines the proven antioxidants found in green tea and grape seed extracts with powerful antioxidant "newcomers" N-acetylcystiene and alpha-lipoic acid, as well as rosemary extract, selenium, and lycopene. What makes AIMProancynol 2000 powerful is the synergy between its various components. They are not only powerful individually, but also work together in what is known as antioxidant cycling. Antioxidant cycling is the term that describes how antioxidants work together to extend each others lives and make each other more powerful. Glutathione not only recycles vitamin C, but is the cells primary antioxidant. According to Lester Packer, Ph.D., maintaining high levels of glutathione is critical for lifelow glutathione levels are a marker for death at an early age. Glutathione diminishes as we age and cannot be boosted significantly through supplements. You can see how the ingredients found in AIM Proancynol 2000 work together to provide optimum free radical protection.  Take 2 capsules per day. Best taken with meals.  Shelf life is 2 years, sealed. Close tightly after opening and store in a cool, dry, dark place (70-75 °F; 20.1-23.8 °C). Do not refrigerate. Who should use AIM Proancynol 2000? Anyone who is concerned with overall health and a healthy immune system. AIM Proancynol 2000 is especially suited to those who have a lifestyle that may generate more free radicals than normal. This would include living in polluted environments, smoking, or participating in extensive exercise (exercise creates free radicals). Is there anyone who should not take AIM Proancynol 2000? There are no known safety considerations concerning the ingredients in AIM Proancynol 2000. However, due to the alpha-lipoic acid present, diabetics should monitor their blood sugar levels. Pregnant women and people who are using other medications or who have serious health problems should always consult their health practitioners when adding new substances to their diet. The green tea used in AIM Proancynol 2000 is decaffeinated using a water filtration-decaffeination process. Like all decaffeinated products, some amounts of caffeine remain. What can you tell me about the ingredients found in AIM Proancynol 2000? This is what happens to us. Our bodies continuously produce free radicals, which are our sparks. These sparks are multiplied because of the foods we eat and the environment in which we live. When too many free radicals are created, they can result in damagemany of todays most frequent diseases, such as heart disease, stroke, cancer, cataracts, and immune disorders are due to free radicals.